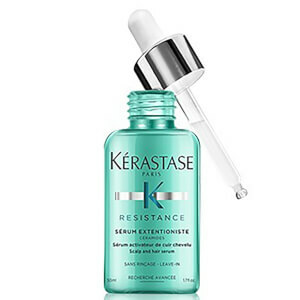 Strengthen hair from the inside out with Kérastase Resistance Bain Extentioniste, a fortifying shampoo that uses powerful amino acids and ceramides to improve elasticity from root to tip. 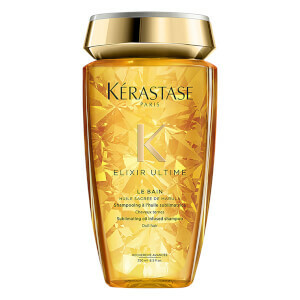 Targeting weakened and brittle strands, the silky formula helps to rebuild the hair’s internal structure to make it more resistant to breakage, whilst a blend of lipids creates a smooth and shiny surface. 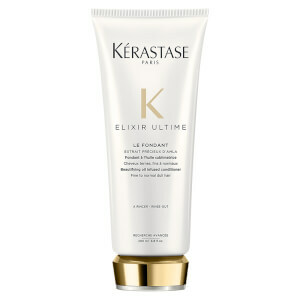 The shampoo gently lifts away the build-up of dirt, impurities and excess oil from the scalp to leave locks fresh, clean and strong. Suitable for weak hair types. 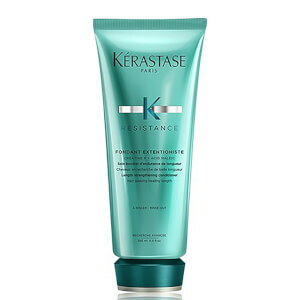 Apply to wet hair, massage and rinse. In case of contact with eyes, rinse them immediately and thoroughly. Aqua / Water, Sodium Laureth Sulfate, Coco-Betaine, Taurine, Cocamide Mipa, Sodium Chloride, Amodimethicone, Laureth-5 Carboxylic Acid, Ppg-5-Ceteth-20, Sodium Benzoate, Polyquaternium-10, Peg-55 Propylene Glycol Oleate, Propylene Glycol, Peg-60 Hydrogenated Castor Oil, Salicylic Acid, Amyl Cinnamal, Hexyl Cinnamal, Benzyl Alcohol, Linalool, Hydroxycitronellal, citronellol, Limonene, Creatine, 2-Oleamido-1,3-Octadecanediol, Benzyl Cinnamate, Sodium Acetate, Isopropyl Alcohol, Sodium Hydroxide, Citric Acid, Parfum / Fragrance.